The idea that modern people evolved in a single "cradle of humanity" in East Africa some 200,000 years ago is no longer tenable, new research suggests. Prof Jean-Jacques Hublin, of the Max Planck Institute (MPI) for Evolutionary Anthropology in Leipzig, Germany, told me that the discovery would "rewrite the textbooks" about our emergence as a species. "It is not the story of it happening in a rapid way in a 'Garden of Eden' somewhere in Africa. Our view is that it was a more gradual development and it involved the whole continent. So if there was a Garden of Eden, it was all of Africa." But Prof Hublin was always troubled by that initial interpretation, and when he joined the MPI he began reassessing Jebel Irhoud. And more than 10 years later he is now presenting new evidence that tells a very different story. The few significant differences are seen in a slightly more prominent brow line and smaller brain cavity. Prof Hublin's excavation has further revealed that these ancient people had employed stone tools and had learned how to make and control fire. So, not only did they look like Homo sapiens, they acted like them as well. "We now have to modify the vision of how the first modern humans emerged," Prof Hublin told me with an impish grin. By contrast, the mainstream view has been that Homo sapiens evolved suddenly from more primitive humans in East Africa around 200,000 years ago; and it is at that point that we assumed, broadly speaking, the features we display now. What is more, only then do we spread throughout Africa and eventually to the rest of the planet. Prof Hublin's discoveries would appear to shatter this view. Jebel Irhoud is typical of many archaeological sites across Africa that date back 300,000 years. Many of these locations have similar tools and evidence for the use of fire. What they do not have is any fossil remains. "We are not trying to say that the origin of our species was in Morocco - rather that the Jebel Irhoud discoveries show that we know that [these type of sites] were found all across Africa 300,000 years ago," said MPI team member Dr Shannon McPhearon. Prof Chris Stringer from the Natural History Museum in London, UK, was not involved in the research. 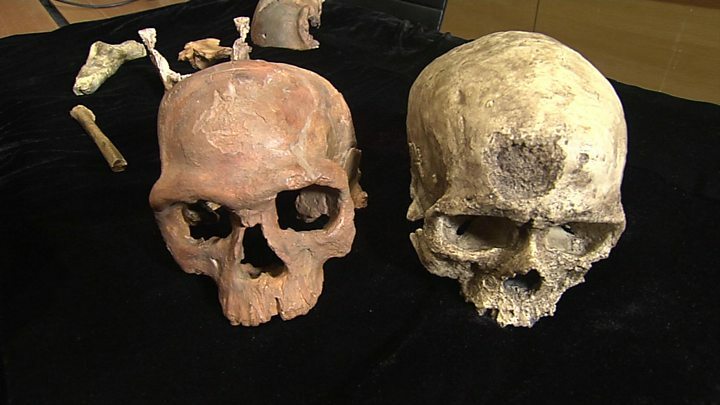 He told BBC News: "This shows that there are multiple places in Africa where Homo sapiens was emerging. We need to get away from this idea that there was a single 'cradle'." "I was saying 20 years ago that the only thing we should be calling Homo sapiens are humans that look like us. This was a view that Homo sapiens suddenly appeared in Africa at some point in time and that was the beginning of our species. But it now looks like I was wrong," Prof Stringer told BBC News.